Unique view of the Dolomites! 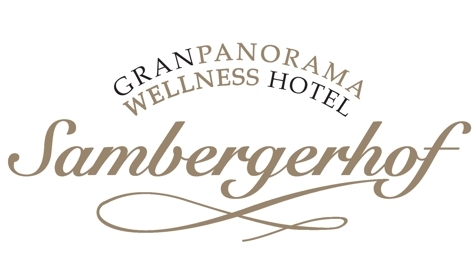 Welcome to Granpanorama Hotel Sambergerhof***S in Villanders! Experience alpine holiday pleasures in a quiet southern aspect with a unique panorama to the Dolomites! At our Granpanoramahotel Sambergerhof in Villanders you’ll enjoy not only a breathtaking view, but also peace and quiet – and as you like to, you can spend it in an active or relaxing way. Our guestrooms are furnished with every modern comfort you may need for a restorative and carefree stay. Every room has a bathroom with shower and WC, TV, telephone, radio, safe, internet access and for the most part a balcony. In the morning you can refresh yourself with a rich breakfast buffet and every day we invite you to have a champagne breakfast. In the evening our chef spoils you with varied four course menus, salad buffet and exquisite wines. 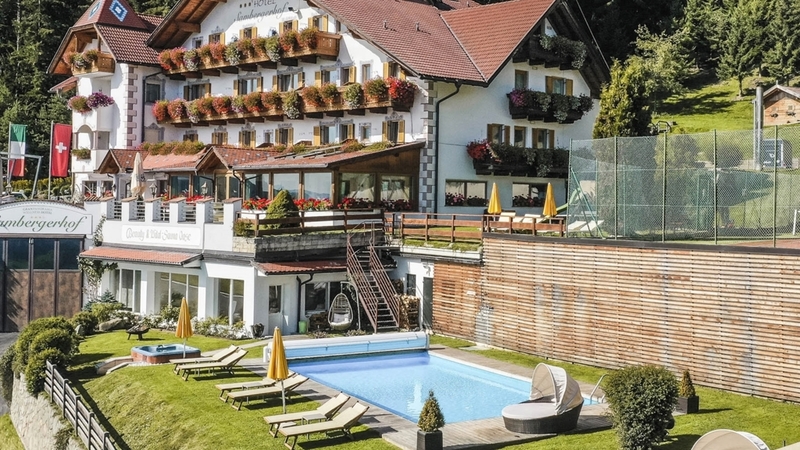 Last but not least our Hotel Sambergerhof offers an outdoor pool with lawn for sunbathing, a tennis court, a spa and wellness area with different saunas, whirlpools, a pleasant hotel bar, elevator, underground car park, private car park and a MTB and e-bike rental (NEW). The Brunner family looks forward to seeing you soon! Room with balcony and a 140° - 200° view of the 30 - 40 km long Dolomites (view of Plose and Odle mountains, Raschötz, Val Gardena, Sassolungo, Sassopiatto, Denti di Terrarossa Mountains, Catinaccio, Alpe di Siusi, Sciliar, Corno Nero and Corno Bianco mountains), sitting area, some with sofa, shower, WC, satellite TV, telephone, safe, hairdryer, free W-LAN access. Room with balcony and a 200° view of the 40 km long Dolomite chain – view of Plose Mountain, Odle Mountains, Raschötz, Val Gardena, Sassolungo, Sassopiatto, Denti di Terrarossa Mountains, Catinaccio, Alpe di Siusi, Sciliar and Corno Nero and Corno Bianco mountains. The room features sitting area, sofa, shower, WC, bidet, satellite TV, telephone, safe, hairdryer, free W-LAN access. View of the forest and meadows, in summer a view of our petting zoo. The room features sitting area, sofa, shower, WC, some with bidet, satellite TV, telephone, safe, hairdryer, free W-LAN access. Pine room approx. 19-25 m² (with bath), balcony with a view of the forest and meadows (summer: view of our petting zoo), the room features sitting area, some with sofa, shower, WC, some with bidet, satellite TV, telephone, safe, hairdryer, free W-LAN access. Room with balcony and a 80°view of the 40 km long Dolomites (Alpe di Siusi, Denti di Terrarossa Mountains, Catinaccio, Sciliar, Corno Nero and Corno Bianco mountains), sitting area, sofa, shower, WC, bidet, satellite TV, telephone, safe, hairdryer, free W-LAN access. Room with balcony and a 140° - 200° view of the 40 km long Dolomites' chain: Plose, Odle Mountains, Raschötz, Val Gardena, Sassolungo, Sassopiatto, Denti di Terrarossa Mountains, Catinaccio, Alpe di Siusi, Sciliar, Corno Nero and Corno Bianco mountains. The room features sitting area, some with sofa, shower, some with bathtub, WC, some with bidet, satellite TV, telephone, safe, hairdryer, free W-LAN access. View of the forest and meadows, in summer a view of our petting zoo. You enjoy sitting area, sofa, shower, WC, some with bidet, satellite TV, telephone, safe, hairdryer, free W-LAN access. Nature’s fireworks of colors adorn the valley skies in autumn. Multitude of leaves in colorful shades and hues of yellow, red, and brown strongly contrast the green of the pine trees. At 1500 meters above sea level, the air is wonderfully fresh and the temperatures are perfect to get active. Enjoy the first sun rays and spend your holidays in Villandro!